Ask a beekeeper how they got started and you’ll hear a love story. We often remark to each other how unexpected it is for us that we ended up not only as beekeepers but of owners of a company with more honey products than we every thought possible. Our passion for bees was sparked out of an obsession for sustainable agriculture, and getting bees was a natural extension of our backyard permaculture hobby as we sought out methods of increasing pollination for our fruit trees, vegetables and herb garden. It wasn’t long before we began to notice a huge increase in our farm’s productivity and the bees have been a vital component in our system ever since. After we started spending more time with our bees and learning about their extremely complex, fragile, and magical societies, we were hooked. Harvesting the tastiest honey in the world from our very own backyard didn’t hurt either. We’ve been hard at work ever since, growing our modest apiary and creating new and unique ways to use our honey. The result of all this love and devotion is HoneySown® Herbs, our growing collection of bee-inspired health and wellness products including a vast array of artisanal honey products to choose from. Welcome to the fascinating world of bees! • Honey bee colonies consist of a single queen, hundreds of male drones and 20,000 to 80,000 female worker bees. Each honey bee colony also consists of developing eggs, larvae and pupae. • The queen bee mates one time and carries a lifetime supply of sperm from then onwards, laying 2,000 eggs for her colony each and everyday. • In order to produce 1 pound of honey, 2 million flowers must be visited. A hive of bees must fly 55,000 miles to produce a pound of honey. One bee colony can produce 60 to 100 pounds of honey per year. An average worker bee makes only about 1/12 teaspoon of honey in its lifetime. • A colony strives to keep the hive at a constant 93 degrees Fahrenheit year round. They regulate the temperature by beating their wings to circulate air and by using water evaporation as way to cool the hive down. • Which kind of bees are produced by eggs depends on what the larvae are fed. The larvae that become queens are fed only royal jelly. Other bees become female workers because they're fed fermented pollen (bee bread) and honey. • Bees are neat freaks. Bees that maintain the hive work diligently to keep it clean. The only bee that defecates inside the hive is the queen, and there are bees that clean up after her when that happens. Honey bees like to clean house by lifting dead bees and discarding their bodies outside of the hive entrance. • Bees will fly up to 5 miles from their hive to find a good patch of flowers. Bees visit these flowers for the nectar, which is their preferred food source, honey is nectar that has been dehydrated and prepared for storage and bees will opt to eat honey when nectar is not available. • Honey bees have been producing honey in the same way for 150 million years. • Honey lasts an incredibly long time. Raw honey contains enzymes, vitamins, minerals. It’s the only food that contains “pinocembrin”, an antioxidant associated with improved brain functioning. • Honey has always been highly regarded as a medicine. It is thought to help with everything from sore throats and digestive disorders to skin problems and hay fever. Because the substance is so inhospitable to bacteria, it was often used as a natural bandage to protect cuts and burns from infection. Today, honey is still used as a natural treatment for dandruff, stomach ulcers, and even seasonal allergies. Bees do far more for us than just produce honey. The environment depends on the pollination that occurs when honey bees gather nectar. As the world’s most important pollinator, bees pollinate $20 billion worth of U.S. crops each year, and approximately one third of all food eaten by Americans is either directly or indirectly derived from honey bee pollination. Without bees many plants - including for crops - would simply die off. Many domestic and imported fruits and vegetables require pollination. Examples include avocados, soybeans, asparagus, broccoli, celery, squash, sunflowers for oil, cucumbers, citrus fruit, peaches, kiwis, cherries, cranberries and melons. For crops such as blueberries and almonds, the honey bee plays an essential role in pollination of commercial crops, with around 80% of the US crop said to be dependent on honey bees. Honeybees can also pollinate clover and alfalfa, which are fed to cattle, so there are implications for the meat and dairy industry too. And that is not to mention the huge range of manufactured food products made from all these ingredients. The Honeybee faces many threats. Unfortunately, not all is well for our friend the honey bee. They are facing many threats such as loss of habitat. Deforestation directly effects wild bee populations because they choose to build their populations in hollowed out trees. Pest infestations such as the parasitic varroa mite and small hive beetle also threaten the health and productivity of bee populations. To complicate matters further there is the ever-increasing proliferation of harmful pesticides around the world, many of which have been proven to be very harmful and in many cases fatal to the bee population. The toxic chemicals find their way into the hive when bees travel to flowers that have been sprayed, but toxins are also introduced to hives knowingly by beekeepers who abuse fungicides and insecticides in the name of hive management. Unfortunately, the very chemicals that are made to control pests and fungus that threaten bees are the very same chemicals that accumulate in beeswax comb and honey creating serious problems in the long term due to severe toxicity. The agriculture tactics of mass mono-crop farming can require bees to be brought in by the truckload from hundreds and even thousands of miles away. This can take what would otherwise be a local outbreak of disease or infestation amongst the honeybee population and spread it far and wide as those bees travel back to their origin. Commercial-scale pollination operations also stress bee populations because once the season is is over thousands of hives are sacrificed because of poor management. These are just a few of the major threats currently facing the Honeybee. The good news is that small-scale beekeeping is on the rise, with many newcomers picking up the craft in their bid to help out. Even if you’re not ready to make the jump to becoming a beekeeper, you can do your part by always buying honey from small apiaries dedicated to chemical-free natural beekeeping methods (like yours truly!). Doing our best to bee helpful. 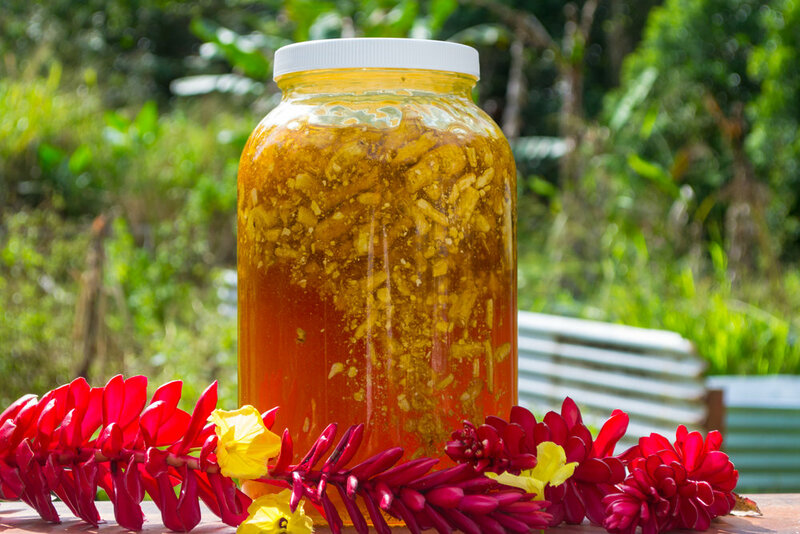 As beekeepers on the beautiful island of Hawaii, we are blessed with a year-round honey season, a pristine ecosystem, and an abundant variety of tropical flowers for the bees to forage on. All of this contributes to our honey of an exceptional quality with flavors that you can’t get from anywhere else in the world. We are committed to raising our bees in the most healthy and natural way possible. We do not use any treatment or chemicals on our farm, and instead elect to keep our bees healthy by using non-intrusive and non-damaging means of hive management. Our bees forage on a wide variety of fruit tree blossoms in addition to the hundreds of tropical plants which grow in abundance in our lush rainforest environment. American Ginseng infusing into fresh, raw Hawaiian honey.